This weekend, hundreds of people gathered in Madrid to demand a referendum on self-determination for Western Sahara. The protest, which is repeated year after year, sought to once again raise awareness on the forgotten territory, which has been occupied by Morocco for 42 years. After a war between the liberation movement Polisario Front and Morocco between 1975 and 1991, a ceasefire was achieved, but Moroccan control of the vast majority of Western Sahara has persisted and the territory has remained disputed. As a result of the decades-old conflict, today, around 200,000 Sahrawis still live in refugee camps in the neighbouring Algerian province of Tindouf, relying on humanitarian aid to survive. Recently, the prolonged situation has led to the launch of a fresh United Nations initiative aiming to resolve the conflict. The former German President Horst Köhler has been appointed as an envoy to the region, in order to mediate between the Polisario Front and Morocco. 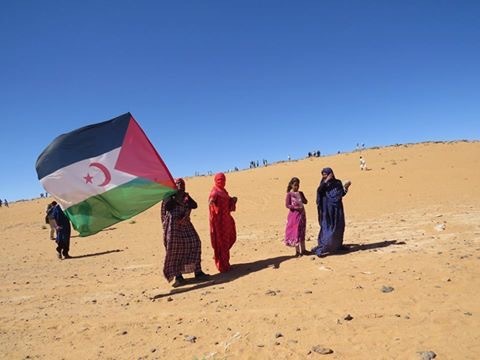 However, even though the UN admits Western Sahara is a non-self-governing territory, subject to the decolonisation process, there are few indications that the Moroccan authorities are ready to relinquish control. Despite the UN’s renewed push for peace, King Mohamed VI has ruled out any deal that could allow the independence of Western Sahara, maintaining the country’s position of claiming full sovereignty over the mineral-rich region. Over four decades since the withdrawal of its former coloniser, Spain, and its annexation by Morocco, devising a comprehensive solution for the region remains complex. Located on the north-western coast of Africa, with an estimated population of half a million people, the territory known as Africa’s last colony was promised a referendum on independence – following recognition of its right to self-determination by the International Court of Justice – but that has never taken place. In the meantime, Morocco continues to exploit Western Sahara’s natural resources through phosphate mining and fishing, whist a long sand wall still divides the territory. Nevertheless, after a long wait, the recent UN initiative instils hope that a fresh approach can finally bring the two parties to the negotiating table. Much hope lies with UN Secretary-General and former Portuguese Prime Minister, António Guterres, who, unlike his predecessor, must not end his term without making real progress on resolving this ongoing dispute.